For a long time, there has been this theory with Etsy Sellers that the more Etsy Items you have, the better. I've tested this theory out many times. At one point, we had nearly 1000 listings in our printable art Etsy Shop, Melinda Wood Designs. It brings us in nice amount of income each month. Right now, it gets round 500 Sales per month on average. But I recently built a brand new Etsy Shop that has only 30 listings. Because I know how to make items people want to buy, within just 2 months of work, this new shop is already bringing in about 250 Sales per month. So one shop which has hundreds of listings, is only bringing in twice as many sales as my other shop with just 30 listings! So my point is this: It doesn't matter how many Etsy Listings you have. It really matters that you are making things people want to buy, and that people can easily find those items on Etsy through keyword searches. It's also important to start an Etsy Shop that is not super saturated with thousands of other Sellers. Instead, find things with low competition, but a lot of demand. What I've found that is more important than anything else is to simply create things that people actually need and want to buy. Then, match those items with simple, clear keywords. As long as you do this, it doesn't matter how many Etsy Listings you have. 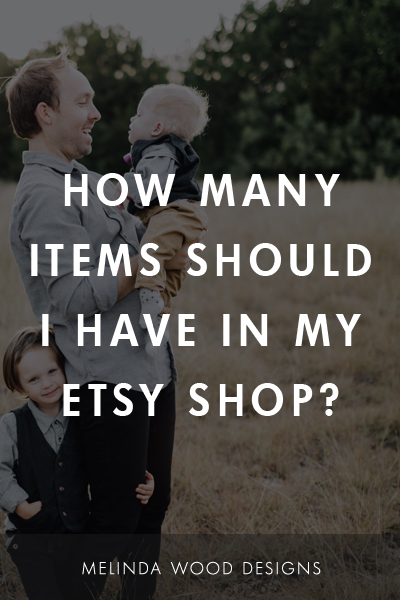 As long as you create things people want to buy right now, then you'll naturally reach a certain number of listings for your Etsy Shop. When certain items don't sell at all, then let them expire. Etsy forces items to expire after 4 months if it never sells. You can set this to automatically renew, but I recommend you don't let them renew. Instead, let that item expire. If no one buys the item in 4 months, it typically (but not always) means that item is a total dud.